Plantar Warts (Verrucae) - How to finally get rid of those painful lumps on the bottom of your feet! 14 Mar Plantar Warts (Verrucae) – How to finally get rid of those painful lumps on the bottom of your feet! Recently, we had a patient present to us with a common but very painful and serious problem on the bottom of her foot – plantar warts. We successfully treated and got rid of the wart using a technique called a blunt dissection, so we thought we’d share with you how we did it and how YOU can get rid of your warts safely and effectively too. For confidentiality purposes, and with her permission, let’s call our patient Jenny, and yes that’s her foot in the image on the left. Jenny is a healthy female that works at a local restaurant here in Masterton. This means she spends long days on her feet, and anything that causes discomfort or pain when walking will be very detrimental and frustrating. Jenny had been putting up with the wart for a several of years now in the hopes that it would go away on its own. She was both frustrated and embarrassed by it, and had enough. 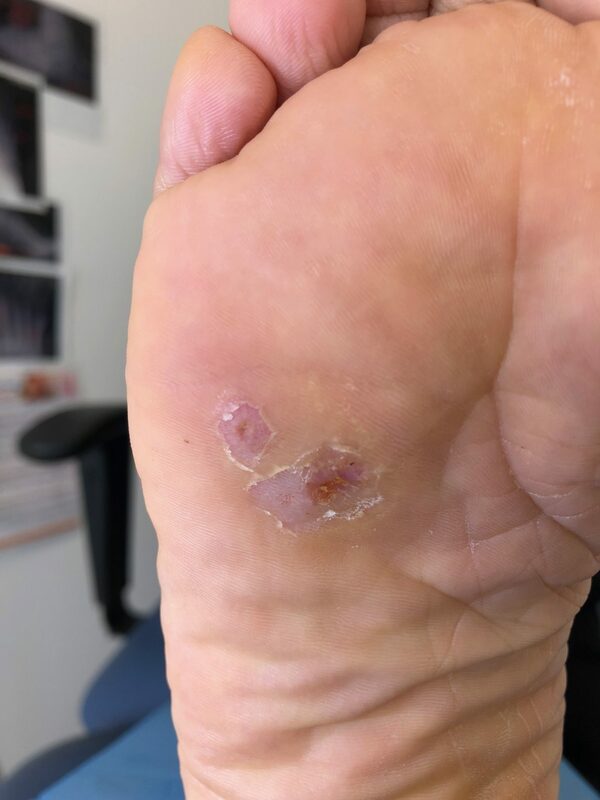 While Jenny hadn’t had a plantar wart, medically known as a verruca, before, her partner had and actually had us successfully treat them some years ago. Because verrucae are caused by the Human Papillomavirus (HPV), they are contagious and spread within households through direct contact, particularly when sharing surfaces daily like showers. They present as rough, round lumps on the bottom of the feet that can vary in size from that of a seed to that of a golf ball. While some may remain asymptomatic, others can be tender, painful, and can feel like you’re walking on a pebble. You may have just one or many warts present at a time, and they can be very tricky to manage. For these types of warts, we often use a procedure called a blunt dissection, which is exactly what we did for Jenny. We like that it takes just one treatment, whereas most alternative treatments require multiple visits and yield poorer success rates, making them timely and expensive for patients. An example of such a treatment often used locally is freezing the wart using liquid nitrogen. This can require over 6 treatments and freezes the wart to the point that a blood blister forms beneath the wart to separate it from the skin underneath. This can be a very painful, uncomfortable and repetitive process. 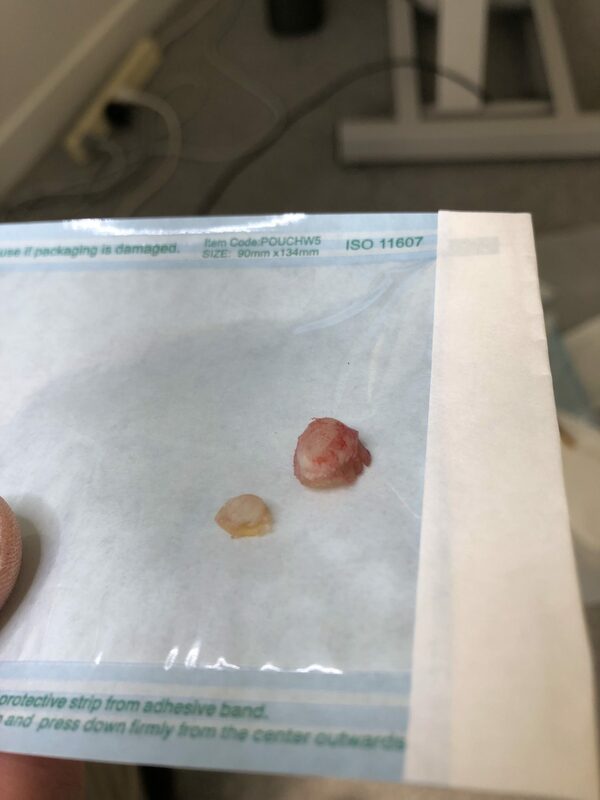 The blunt dissection procedure involves using local anaesthetic to completely numb the area of the wart, circumscribing the edges of the wart using a blunt scalpel and then removing the wart in one scoop. Simple, right? We usually find that patients are pleasantly surprised with the ease, simplicity and the relatively painless nature of the procedure. We always take extra measures to ensure our patients are comfortable, such as applying a numbing cream to the skin before injecting the anaesthetic with a very small needle – the same size as the botox needles that insert into the face and body. Recovering after the procedure is also simple, and was so for Jenny. For the first two weeks following the procedure, we alleviated as much pressure as possible away from the area where Jenny’s wart used to be. We did this using felt padding so she remained as comfortable as possible while on her feet all day at work. While you can continue to walk immediately after the procedure, you should expect to be back to full capacity after a couple of weeks. At times, we’ll put patients in a post-operative shoe for 1-2 weeks, depending on the location and severity of your plantar wart. In our experience, we find that when all of the viral wart tissue is removed, the skin heals very quickly as it is well vascularised (good blood supply). The ‘hole’ left from where the wart used to be flattens over as the foot heals. We’re very happy with the outcome of Jenny’s procedure (and so was she!) that you can see in the one month follow-up visit picture to the left. 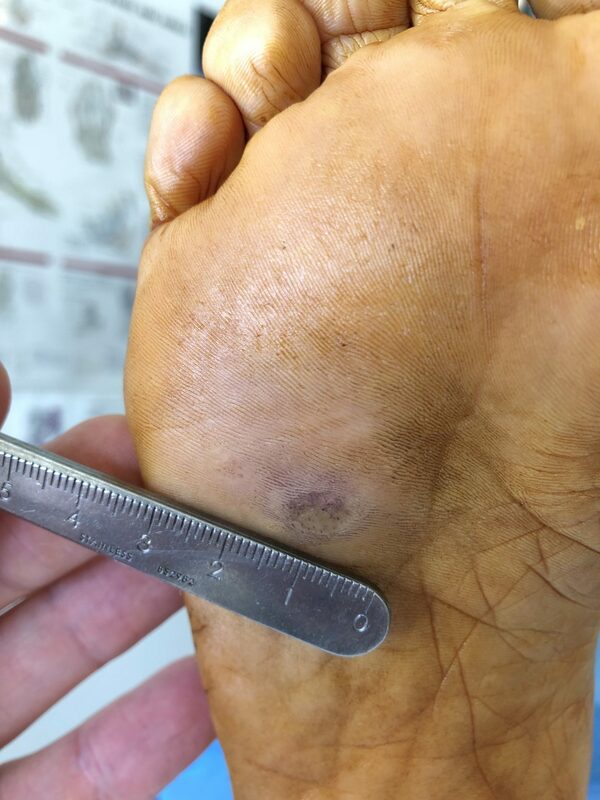 For more information about verrucae, the procedure, or how we can help you and your family manage stubborn plantar warts, give our team a call on 0800 869 526 or book online!